And my new one. That's right a new Tele after ten years of looking for another one... I'm building one since finding this, which is supposed to be here today, if UPS can make it through the mud. It's about to flood around here... Still too cold, but that's about to change. 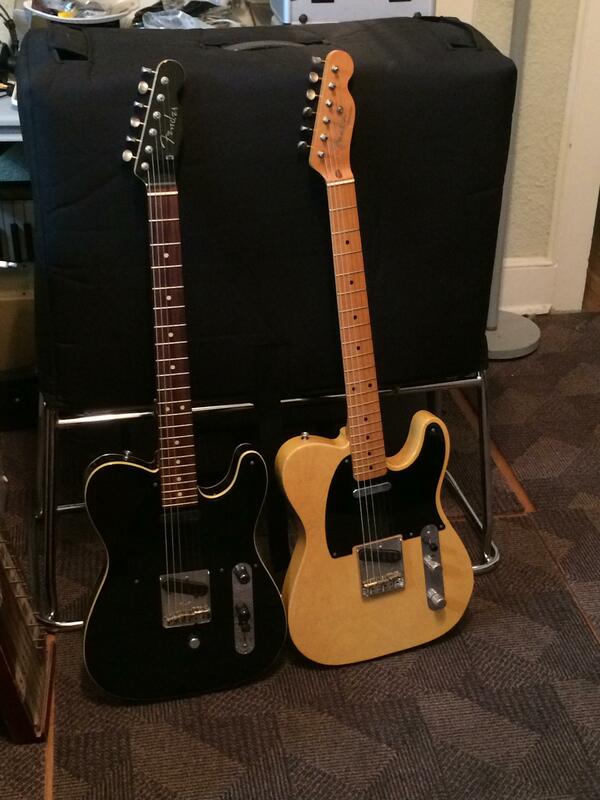 I'd been wanting a 60's style six saddle Rosewood board Tele for a long time. Most guitars are too blah or too expensive, and Rosewood board Teles are actually maybe one in ten to Maple fingerboard Teles. This thing popped up, ticked all the right boxes, cool, unusual, rare, and like all my other usual scores, just about the prettiest girl in town ;-) It's an old Warmoth body with super old Duncan Tele pickups, dream stuff, to me. I found an equally cool neck, a nut, a set of tuners, a decal (skip the decal?). It's Alder, two piece but off center joined, in a way actually correct if you're mimic-ing CBS Fender stuff. Last edited by Guildedagain; 03-18-2019 at 07:47 PM. Spoke too soon on the Warmoth body, should never do that before it's in your hand... it's in limbo "arriving late" without an actual location since Jacksonville FL on the 18th, that's the day it was supposed to be here. That's because he sent it Parcel Select, translation; it's around a dollar cheaper and takes ten days instead of two or three... Even the local postmistress who's helping sort this mess out says she has no idea why people use it, she said it could be as little as a ten cent difference and they'll pick Parcel "Select"... Why, because it sounds so special? The most expensive guitar I've ever bought online took 8 days to get from the seller to me due to a shipping choice mistake. It was a hollowbody too. Fortunately it was superbly packed…but I was gritting my teeth a bit towards the end. Just make sure you change the switch tip...Strat switch tip?... 'jeez...Dakaware or...dumpster? Sandy, I don't see it listed on the bottom of the page, what else are you hiding? Inquiring Minds want to know. ...ask him about...well..."Have you ever felt a sound?" Actually, that "wrong" switch tip, a black 70's Strat style switch used to signify custom wiring, 5 way switch, the volume knob is different too, same thing, sometimes it was from mods. I may never see this guitar. It's still not here, and USPS tracking has gone totally "dark", saying the same thing everyday, "Arriving late", no location, no recent locations. I feel like I stupidly jinxed it by posting about it here before it got here. So now I have this really nice neck, sort of unique, ferrules and tuners are on (Gotoh factory aged, 100% awesome, each tuner stamped Japan). The nut turned into a snafu also, bought two bone Tele nuts from an eBay seller who sent me two plastic Gibson acoustic nuts, wt fig is wrong with people? Since then bought a couple others. The Stratosphere has really nice one, bleached and unbleached. Last edited by Guildedagain; 03-24-2019 at 11:57 PM. I only list the Guilds here, because it's a Guild site. The other acoustic guitars: '97 Bourgeois Slope D-140, '02 Martin D-18 David Crosby Signature, '03 Gibson WM-45, '13 Martin 000-17SM. There's a few non-Guild basses too. 1) Tele 'number one' is a factory-black early '70s Tokai Tele, factory-routed for an early Parsons-White string-bender unit (Tokai bought around 200 units from Parsons, way back when). It belonged to a friend of mine who used this guitar to play with Kris Kristofferson. It was his main 'road axe' and was used as such from the '70s thru the '90s. The pickups are an older EMG Tele set, with a Mid-boost control instead of a tone pot. The boost, turned up, can knock the heck out of a hum bucker Les Paul! I currently have the bender function bypassed. The face of the headstock has been painted black to match the body. There is a nice big fat 'counterfeit' silver Fender logo on it, too. It has a six-saddle bridge on it. 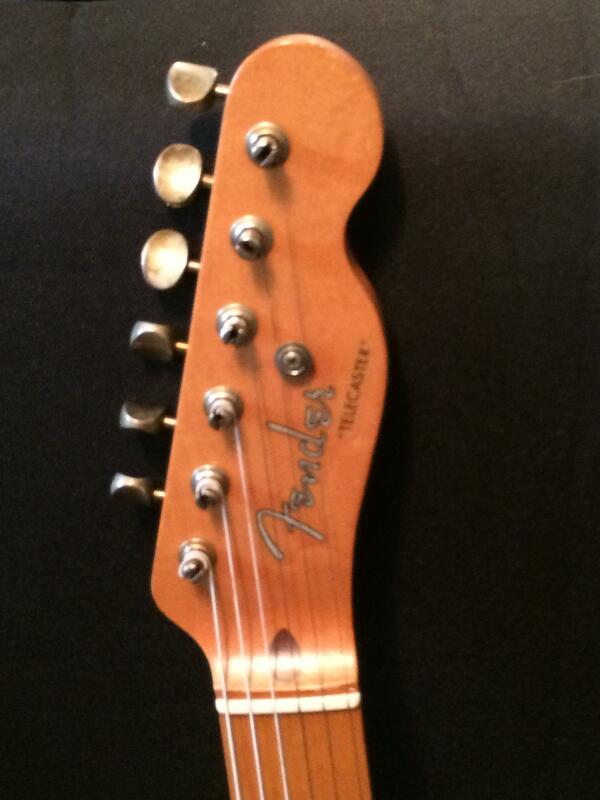 The original Tokai neck felt like a normal '60s/'70s tele neck. After 20 years or so, my friend put a much bigger Warmouth neck on it. 2) Tele 'number two' is a parts tele with a one-piece ash body with a relic'd butterscotch finish, maple neck and a black 'guard. The pickups are underwound and probably made by OCD pickups. Back to the 'parts guitar' back-story. The guy who originally purchased/assembled/sold this guitar is a dealer friend on mine. This fellow typically bought 50 necks 50 bodies at the same time, then 'picked and chose among them' for the best fit. This body and the neck fit together wonderfully, with a nice tight fit. Additionally, there is no need for even a thin neck-pocket shim to line the angle of the neck up with the body and saddles. Perfect. The relic'd finish? It looks pretty good. I'm not a big fan of the relic process, but believe that the cracked-up finish allows the body of the guitar to vibrate more freely, which means that they will sound better than the same guitar with a thick lacquer finish. Your mileage may vary; just sayin'. In closing, really nice guitar, though I may change the pickups to something less underwound some day. In closing guys, I apologize for no pics. I haven't tried to do pics here since photobucket went commercial, but I may prevail on on of you folks to post them for me. EDIT: Five days after I wrote this post, kakerlak posted my pics for me over on page 6 of this thread. I'm going to see if I can 'borrow his pics' and attach them to my original post on the 25th. Yay, it works, at least for me. Thanks so much Kak'! Last edited by gilded; 03-30-2019 at 06:45 PM. 1) a factory black early '70s Tokai Tele, factory-routed for an early Parsons-White string-bender unit (Tokai bought around 200 units from Parsons, way back when). A friend of mine who used to played as his road axe with Kris Kristofferson from the '70s on. He changed the factory neck after 20 years or so, then put a much bigger neck on it. I bought it out of his Estate around 2010. The pickups are Old-school EMGs with a Mid-boost. 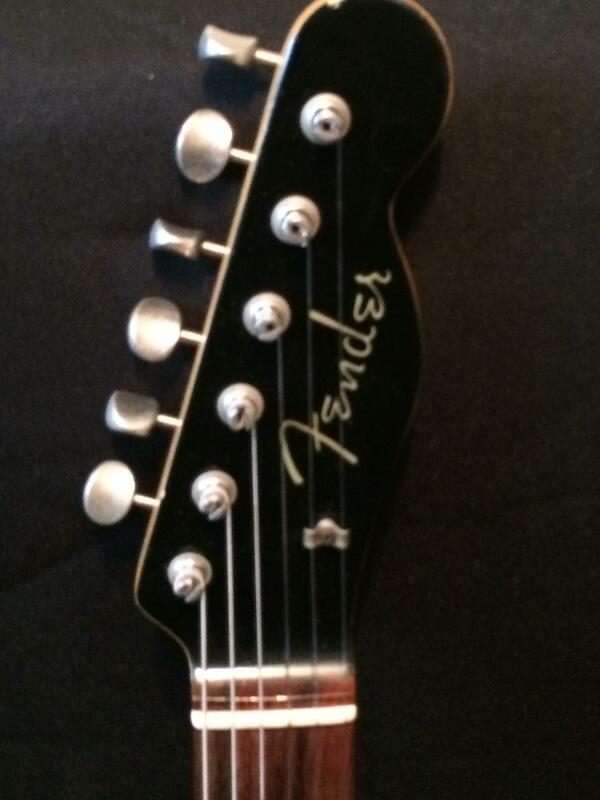 It is currently set without the bender and has a nice big Silver Fender logo on the headstock. The boost can knock the heck out of a Paul in the right hands :) Very nice guitar. 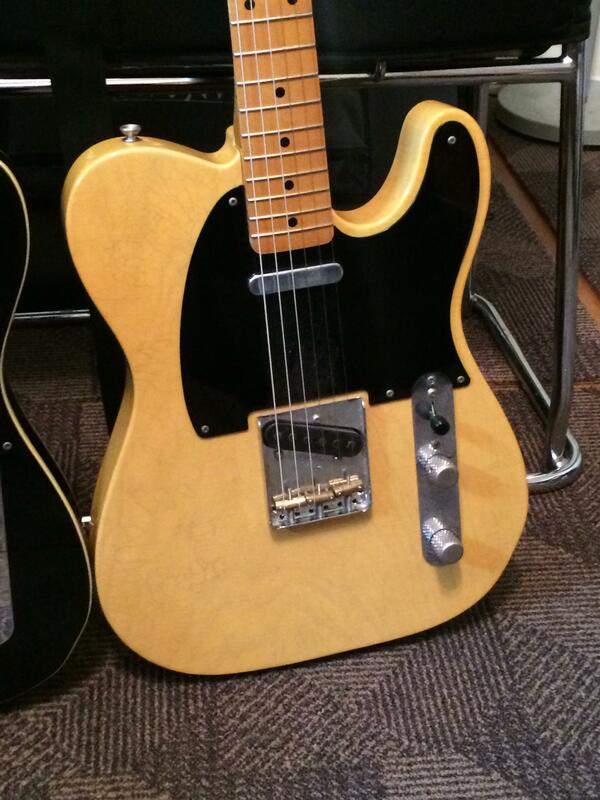 2) A parts tele with a one-piece ash body, maple neck & fingerboard, black 'guard and a relic'd butterscotch finish. The pickups are underwound and probably made by OCD pickups. The guy who originally bought it purchased 50 necks and bodies at the same time and matched them for 'fit' as best he could. 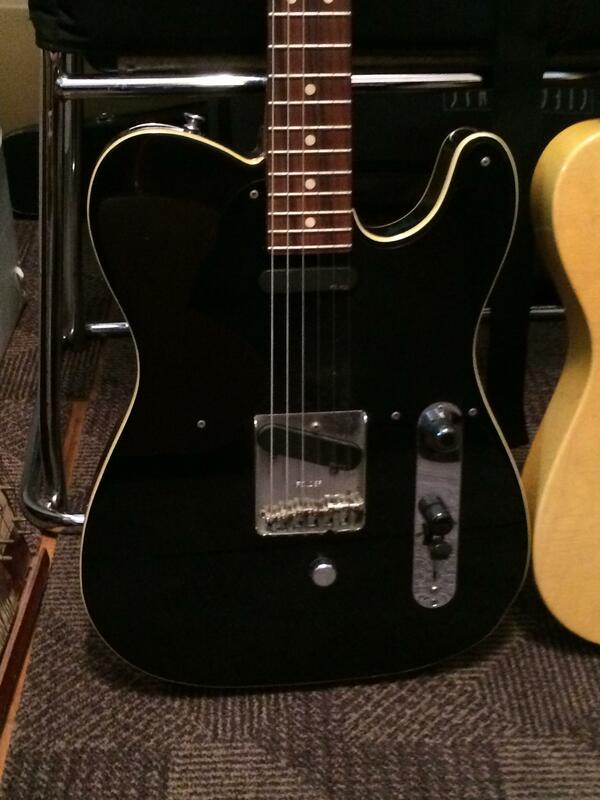 This one was then sent to one of the aftermarket relic shops for the Black Guard Tele look. The best news is that the body and the neck fit together perfectly, with a nice tight fit and no need for a shim to line the angle of the neck up with the body and saddles. Very Nice guitar, though I may change the pickups to something less underwound. Sandy, are you out there, son? Harry, imgur might be the cleanest photo-hosting site these days. I can host up some pics for you, if you feel like e-mailing them and either give you the resultant links of post them directly here myself. As for teles, I've had several over the years, but what's left these days are a mid '90s birdseye G&L ASAT and an older Warmoth thinline with a figured ash body and semi-figured maple neck, old SD antiquity in the bridge and probably '80s SD strat pickup in the neck.